The vector was made by viesiu. a few hours, a simple wallpaper, just want to do an wallpaper from this art. So, hope you like it! Browse Soul Eater Gallery: Recent | Popular. Amazing grunge wallpaper, the textures aren't low quality and don't 'scratch' the surface either. The brushes are great and although the gradient in the left is a bit sudden, still looks neat. The text kills the roughness of the wall, it's too delicate. I suggest a grunge font, just search here. I noticed that the vector you used is missing the same part of the original scan as the vector I made for my own wall. o_0 Coincidence? haha, except mine had trippier colors. Awesome paper. Definitely will be using this one. Very grunge (Y) Like the colors and composition (:. Wow, I like it ! Nice work. I love this scan. Really looks cool in monotone. 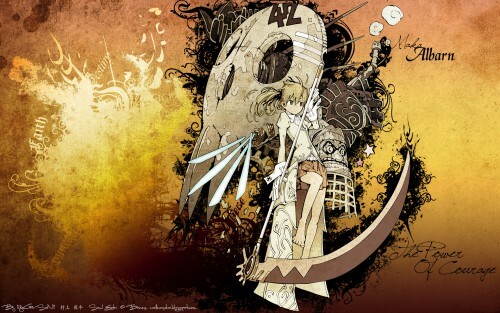 Maka looks awesoe in white! The grunge texture is so fitting! Love it! Whoa. Awesome wall! Thanks for sharing! I love all the textures and colors. Great job! Very nice.Thank you for the upload!